Over the course of a career spanning 30 years, Cedric the Entertainer has solidified his status as one of the world’s premier performers. In July 2018, the actor and comedian was honored with a star on the Hollywood Walk of Fame. In addition to starring in and executive producing THE NEIGHBORHOOD, Cedric currently appears in the hit TV comedy “The Last O.G.,” starring Tracy Morgan and Tiffany Haddish. Previously, he starred in “The Comedy Get Down,” a mockumentary series inspired by events that occurred behind the scenes of the comedian’s successful stand-up tour of the same name, with George Lopez, D.L. Hughley, Eddie Griffin and the late Charlie Murphy. His comedy specials include “Cedric the Entertainer: Live from the Ville,” which was taped at the historic Ryman Auditorium in Nashville and premiered on Netflix in 2016, and “Cedric the Entertainer: Taking You Higher,” which aired on HBO. In film, Cedric is perhaps best known for his crowd-pleasing performances in the hit “Barbershop” film franchise, as well as “The Original Kings of Comedy,” the Spike Lee-directed feature that chronicled the record-breaking Kings of Comedy Tour. His extensive list of movie credits includes “Why Him?” with Bryan Cranston and James Franco; “Be Cool” with John Travolta; “Intolerable Cruelty” with George Clooney; the animated “Madagascar” and its two sequels; “Top Five” opposite Chris Rock; “A Haunted House” and its sequel “A Haunted House 2” with Marlon Wayans; “Larry Crowne” with Julia Roberts and Tom Hanks; “Cadillac Records” opposite Adrien Brody and Beyonce Knowles; “Street Kings” with Keanu Reeves; “Welcome Home, Roscoe Jenkins” with Martin Lawrence; “Talk to Me” opposite Don Cheadle; “Man of the House” with Tommy Lee Jones; “Lemony Snicket’s A Series of Unfortunate Events” with Jim Carrey; “Dr. Dolittle 2” with Eddie Murphy; “Charlotte’s Web”; “Ice Age”; “Big Momma’s House”; and “Code Name: The Cleaner” with ELEMENTARY star Lucy Liu. Most recently, Cedric earned critical acclaim for his performance in the drama “First Reformed,” starring Ethan Hawke and Amanda Seyfried. Through his production company, A Bird and a Bear Entertainment, Cedric developed and produced the feature film “Johnson Family Vacation,” in which he also starred. In 2009 he made his directorial debut with “Dance Fu,” starring Kel Mitchell. Cedric made his Broadway debut in the David Mamet play “American Buffalo,” receiving critical acclaim. Additional creative endeavors include a men’s designer hat line, Who Ced, which he launched in 2011, and a comedy book titled Grown-A$$ Man. An active philanthropist, Cedric founded the Cedric the Entertainer Charitable Foundation, which provides scholarships and outreach programs to enhance the lives of inner-city youth and their families in his hometown of St. Louis, Mo. 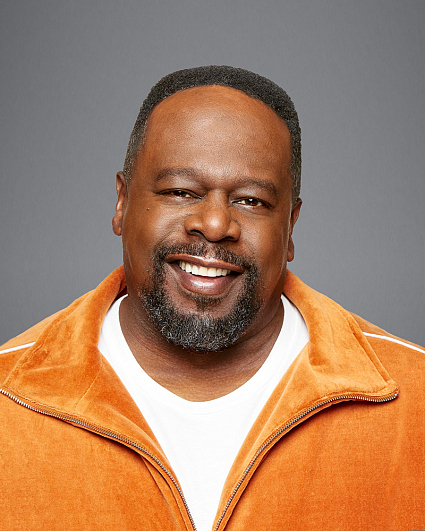 His annual Cedric the Entertainer Celebrity Golf Classic raises funds to benefit the Kyles Family Foundation, the Brotherhood Crusade of Los Angeles and the Boys & Girls Club of Camarillo – all of which support inner-city and at-risk youth. Cedric’s birthday is April 24. Follow him on Twitter @CedEntertainer and Instagram @cedtheentertainer.